1. King C, Diaz HB, McNeely S et al. LY2606368 Causes Replication Catastrophe and Antitumor Effects through CHK1-Dependent Mechanisms. Mol Cancer Ther. 2015 Sep;14(9):2004-13. Wu W, Bi C, Bence A K, et al. Antitumor activity of Chk1 inhibitor LY2606368 as a single agent in SW1990 human pancreas orthotopic tumor model. Cancer Research, 2012, 72(8 Supplement): 1776. Lainchbury M, Matthews T P, McHardy T, et al. 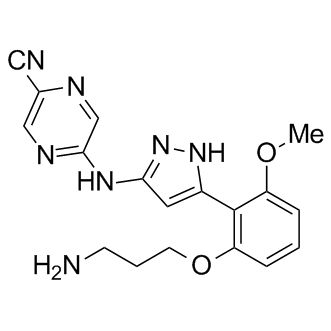 Discovery of 3-alkoxyamino-5-(pyridin-2-ylamino) pyrazine-2-carbonitriles as selective, orally bioavailable CHK1 inhibitors. Journal of medicinal chemistry, 2012, 55(22): 10229-10240. McNeely S C, Burke T F, DurlandBusbice S, et al. Abstract A108: LY2606368, a second generation Chk1 inhibitor, inhibits growth of ovarian carcinoma xenografts either as monotherapy or in combination with standard-of-care agents. Molecular Cancer Therapeutics, 2011, 10(Supplement 1): A108.